This article covers how to force others to make a copy of Google Docs document before viewing it. Normally, when we share some Google Docs document, in view only or edit mode, we share the original document directly. However, if you want, you can share only a copy of your document. Thus, the original document will belong to you only. You can make further changes in the document and those will remain up to you. Other people won’t see those changes and there will always be just a copy of your document. Natively, there is no direct option for doing this. 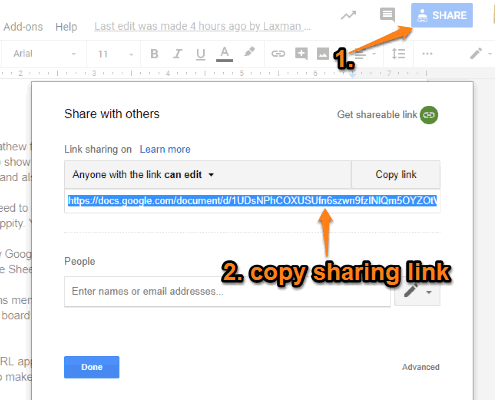 However, you can tweak the URL of your Google Docs document before sharing it and then it will be possible. When another person will open the URL, he/she will be forced to log in to his/her Google account and create the copy of the document you’ve shared. How to Force Others to Make a Copy of Your Google Docs Document before Viewing It? Step 1: This step is simple. You need to share the document. For that, open a Google Docs document and then use the SHARE option. You can set if you want to share it with others with edit or view only mode. 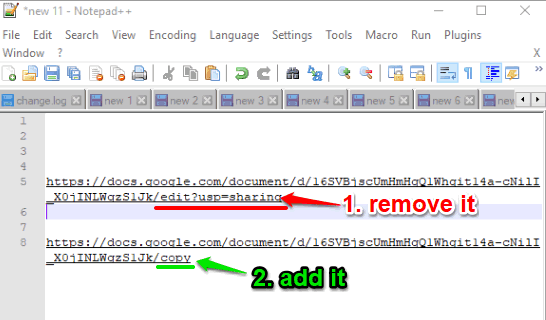 Step 2: When the URL is ready, copy it to Windows clipboard, and then paste the copied URL in any text editor. Step 3: This is a very important step. You need to do a little change in the URL. Just remove edit and all the characters present in the URL just next to edit, and add “copy” in the URL. See the screenshot added below. Step 4: Now copy the changed URL and share it with anyone. The person has to log in first and then make a copy of that document to view it. Did you know you can also share a Google Docs document in preview mode? You must have also received some Google Docs document prompting you to make a copy of it so that you can view it. If you want to do the same, this article is all you need. There’s just a simple tweak in the sharing URL you need to make. After that, you can force others to make a copy of your Google Docs document before viewing it.